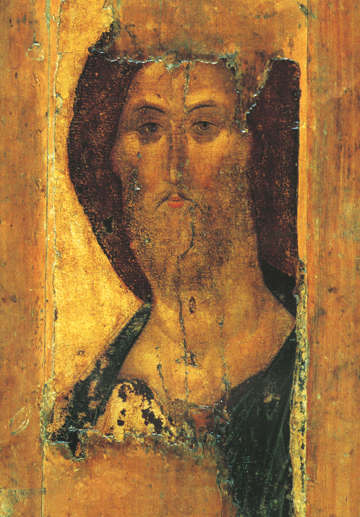 This very famous icon of Christ is called Spas or Saviour and was painted by the most renowned iconographer of Russia St. Andrei Rublev in 1410 for the Monastery of Svenigorod near Moscow. Originally from the Deisis or Supplicating tier of the iconostasis or icon altar screen just above the Royal Doors, Christ here as Saviour expresses great love and compassion for us sinners in a face filled with light, kindness, and gentleness. The story of this icon is also quite unusual, showing God’s great Providence. In 1918 experts of Russian iconography, knowing that this celebrated icon painter of the 14th-15th century had lived in this ancient town, went to look if somehow one of his icons had lain there unknown over the centuries. After a careful search in the Cathedral of the Annunciation when nothing was found, the search widened to the surrounding annexes around the church. There in a timber store under a firewood pile they found three blackened icon boards with paint peeling. When they were cleaned this icon appeared with icons of the Archangel Michael and St. Paul. Later a document was found to confirm the truth of this wonderful find.